Was Amy Winehouse Jewish? Yes, she was. The singer, who was found dead today in her London home, was born in Southgate, London to Janis, a pharmacist, and Mitch, a cab driver. A 2010 article in Moment Magazine titled "Surprise, They're Jewish," describes Winehouse as "The 27-year old British, bee-hived vocalist and tabloid headliner is equally known for her innovative songs and substance abuse problems; references to her 'pipes' could just as easily conjure her vocal chords or drug paraphernalia. Yet, the bad girl with the pin-up tattoos, soul style and Marilyn Monroe mole piercing was born to Mitchell and Janis, a Jewish couple in north London. Not everyone is surprised to hear that Winehouse is Jewish. Referencing her Semitic-looking visage, Sarah Silverman once quipped, 'She is Jewish, right? If she isn’t, someone should tell her face.'" Her obituary in the New York Times states that "Winehouse showed an early talent for performing, as well as an eclecticism that would characterize her later work. She loved her father's Sinatra records, but she also liked hip-hop; at age 10 she and a friend formed a rap group called Sweet 'n' Sour that Ms. Winehouse later described as "the little white Jewish Salt-N-Pepa." So far, the cause of Amy Winehouse's death is not known. While going for drug abuse treatment seems to be a fad these days for celebrities, there are some celebs who really need it but don’t give it much attention. Did she practice Judism? To what extent did she practice? Was her family observant? Anonymous: I'm not sure if you're a rabbi, but I am. I can tell you that I've never officiated at the funeral of a Jewish person and criticized the deceased (or his/her family) for not being observant enough. After all, what is observant enough? By who's standards are you measuring Amy Winehouse's Jewish practice? By your's? I'm sure if you want to tell me your practice of Judaism and how observant you are, I can find many Jews who will shun you as being not observant enough. Amy Winehouse was Jewish. Her parents were Jewish. She considered herself Jewish. Even if she married a non-Jewish man, she was still Jewish. Rather than raise the questions you raise, I'd rather look at what we can learn from her death. What is the spark we can use from her addictions to teach the community. Rather than articles like this one in Lilith Magazine asking "But Really, How Jewish IS Amy Winehouse? ", I'd much prefer an op-ed like that of Rabbi Shais Taub, who works with those suffering from addiction. 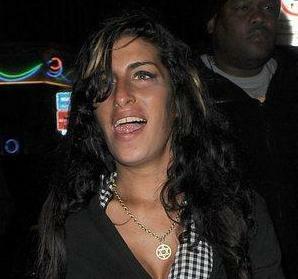 Rabbi Taub wrote "Was the World Powerless to Stop Amy Winehouse?" in the Huffington Post. I hope you'll read Rabbi Taub's words and reconsider your questions. In death, does Amy Winehouse's practice of Judaism really matter? She is entitled to be buried alongside the more pious of Israel. Baruch Dayan Ha-Emet - Blessed is the True Judge. Thank you Rabbi Miller - well said. Anonymous - I feel sorry for you. Racism or Anti-Semitism have never done any good for the world. Within all groups of people, there are bad and there are good. We should all develop our hearts to see people as individuals. First,the fresh,oozing talent19yr old beautiful obviously jewish girl. A skeleton staggering around in heels,tottering on the edge of death. did amy winehouse have a bar mitzvah? Any person that would judge another person based on race or religion is ignorant to the world around them. People have to realize that we all came from the same gene pool, Adam and Eve. From there all nations, races, and communities started. People are people. I'm sorry if you believe Jews to be greedy scandleous leaches however there is nothing that anyone from the outside can do to change that. That you must work on yourself. I would suggest that before making statements about Jews you should do some of your own research into what Jews are really all about. Take a trip to a shul and talk to a Rabbi. Ask the Rabbi about Mitzvahs and the rules about giving and helping, ask the Rabbi about what a Jew's place here in the world. Ask the Rabbi about why Israel is so important to us. If after you talk to the Rabbi you still feel the way you do then you statements will at least be based upon opinion and not ignorance.